Lahore is the second largest city of Pakistan and the provincial capital of the Punjab. In ancient times, it was an outpost of Kangra hill Kingdoms and was a cut-off township on the trade route to Delhi. There are a number of comely buildings that Lahore has inherited from the British during their rule. Punjab University (Old Campus), built in 1882, is the oldest university of Pakistan. Lahore High Court, built in 1874 is the oldest superior court in Pakistan and the General Post Office, built in 1892 is one of the oldest buildings erected during the British Rule. Regime College, established in 1864, is the oldest higher edification institution in Pakistan. Aitchison College established in 1886. The shrine of this renowned saint of Lahore (d. 1071 C.E. ), is proximate to the junction of the Lower Mall and the Circular Road. Data Sahib was a great Sufi saint whose well-kenned work, “Kashf-ul-Mahjub” has been translated from pristine Persian into several European languages. The Badshahi Mosque is across the courtyard from Alamgiri Gate of the Lahore Fort. 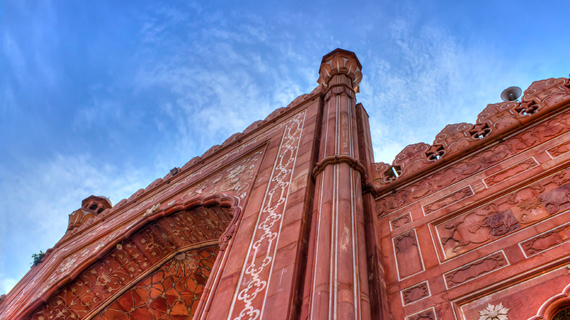 The Mosque, which is made up entirely of red sandstone was built by Emperor Aurangzeb, the last of the great Mughals. Its construction was completed by 1674 AD. The founder of the mosque was Nawab Shah Bhikari Khan, son of Raushan-ud-Daula Turrabaz Khan, deputy governor of Lahore during the reign of Muhammad Shah and the viceroyalty of Mir Noin-ul-Malik. Golden Mosque is situated in the Kashmiri Bazaar. It was built in 1753 AD. It is remarkably beautiful with three golden domes. The mosque is elevated on a higher plinth, surrounded by old bazaars. Because of its color the mosque glitters in the sunshine. Moti Masjid or Pearl Mosque was for the exclusive use of royal ladies. It is carved from marble having the lustre of pearls. Wazir Khan’s Mosque is in the old city, 300 meters from Delhi Gate. This unique mosque is one of the most beautiful in Pakistan. It was built in 1634 by Hakim Ali-ud-din, popularly known as Wazir Khan, who was governor of the area during the reign of Shah Jahan. The Mosque is justifiably famous for the colorful fresco and tile decoration which adorns both the interior and exterior of the building. This museum was established during the British Raj in 1864. It exhibits a consummate cross-section of the Culture and History of the region with infrequent and best accumulation of the Buddhist art from the Gandhara Period, Islamic artifacts, Calligraphy, Old Manuscripts, Arms, Costumes and Jewelry. A prodigiously and sizably voluminous and fascinating private Museum kenned as Faqirkhana lies inside the Bhatti Gate and is worth visiting. The museum houses a variety of old paintings, including pristine manuscripts in different languages and artifacts from South East Asia and the Indo-Pak sub-continent. This museum was authentically Shakir’s House which he made for himself. After his death it was bought by Idara-I-Saqafat-e-Pakistan and formally turned into a museum on April 3rd, 1976. The conception behind it was not only to preserve the great artist’s paintings and other masterpieces under one roof but additionally to open this cumulation of modern and traditional architecture to the public. Situated at Poonch house, Multan Road, Lahore it was established in 1950. This is an Industrial and commercial Museum, which is betokened to depict country’s economic resources both in the form of raw products and worked objects. The main hall exhibits a range of variety of material such as well plated musical instruments, table lamps of camel skin, cotton, silken-woolen and embroidered textiles from all consequential cites of Pakistan. Bazaars and market places in the Lahore are of course legendary- the Kashmiri, Suha, Chhatta, Dabbi, Anarkali are the famous ones of the old city. Liberty, Main market, Barkat Market and Fortress Stadium are included in modern Lahore. These markets supply everything that anyone could possibly want; from cloth to copper, brass and silver-ware; watches and bangles to carpets. Anarkali Bazaar is a treasure-trove, selling virtually everything from handicraft to transistor radio, tin sauce pan to refrigerator, a maze of lanes and alleys which stretch northwards from the Mall at the Central Museum end. Ichra Bazaar has the best quality of unstitched silk, cotton and printed material of all sorts. On the other hand, Mozang Bazaar sells some particularly interesting hand-block printed cloth, tablecloth and bedspread.